The DiNi will operate for three days without requiring a battery change, then when it does just recharge it as you would your Trimble GPS system battery…the batteries are the same to ensure convenience and productivity. When a job is complete, easily transfer data from the instrument to a computer by using a USB storage device; You don’t have to carry your instrument in to the office. reduces the number of stations needed by up to 20% because the Trimble DiNi is less impacted by a rod hidden by vegetation or hilly terrain. makes leveling in low light conditions, for example, in tunnels, easier because only a very small part of the staff needs to be illuminated. ensures greater accuracy through less influence of refraction near the ground. The large graphical display of the Trimble DiNi is also unique, and is complemented by the latest Trimble keyboard for easy operation. Crew members used to operating other Trimble systems will easily adapt to the Trimble DiNi. 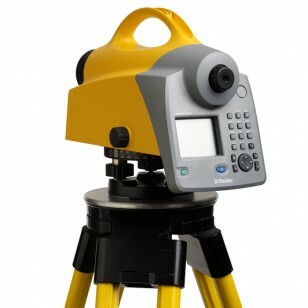 The Trimble DiNi Digital Level is designed to support the rest of Trimble’s Integrated Surveying portfolio. The Trimble DiNi interface is based on Trimble’s other advanced and field-proven controllers for easy adoption of the instrument by your crews. Proven Optics by Carl Zeiss ensure the Trimble DiNi offers the highest precision and best resolution.